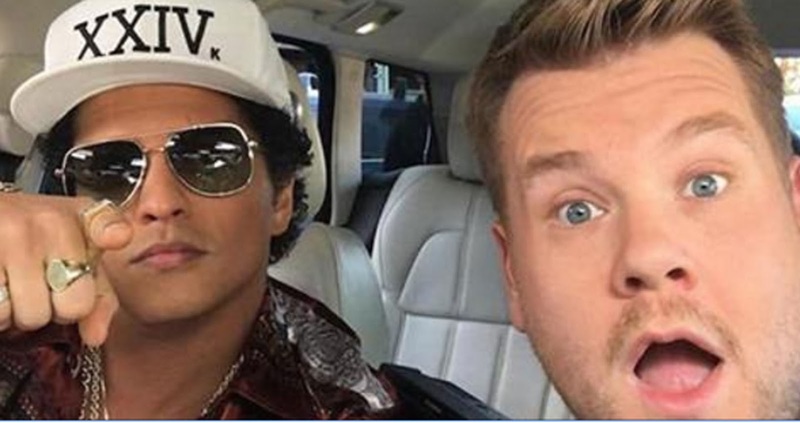 Home » Videos » Bruno Mars And James Corden’s Carpool Karaoke Is The Best One Yet, When They Start To Sing It’s Magic. Bruno Mars And James Corden’s Carpool Karaoke Is The Best One Yet, When They Start To Sing It’s Magic. Bruno Mars and James Corden made sweet sweet harmony last night on Corden’s famous bit, Carpool Karaoke. We’ve seen some great carpools in the past with Elton John and Stevie Wonder. But this time the four-time Grammy winner and the fun loving host got funky as they drove around Los Angeles belting Mars’ tunes. The duo covered the discography from “24K Magic” to “Grenade” and “Perm” to “Uptown Funk,” of course. As the duo got to know each other a little better, Corden learned some interesting facts about the famous funky singer. Apparently, the superstar is rather low maintaince on tour, just needing the bare essentials in the dressing room. He also found out that Mars has been getting funky since age 4, when he started impersonating Elvis Presley everywhere he went. Mars is also rather proud of the fact that he can literally wear any hat in existence and look good in it… and we can’t help but agree. “I’d catch a grenade for you,” Corden told the Grammy winner at one point, referencing Mars’ lyrics. “If the pin was in it, I’d catch it. But if you’d taken the pin out of it I’d run,” he added, jokingly. “That’s it. I’ve never felt more alive,” James Corden said at the end of Bruno Mars’ carpool karaoke ride, which really sums up their full 15-minute ride. Check out the hilarious singing session in the video below!